Nurses at a London trust are working together to make sure that patients receive the same high level of care from staff in different clinical areas, 24 hours a day. Ward sisters and matrons at Guy’s and St Thomas’s NHS Foundation Trust are leading the way on a new project to ensure patients receive safe and effective care at all times. ‘Care must always be delivered with the utmost kindness,’ says the trust’s chief nurse and director of patient experience, Dame Eileen Sills. ‘We’re determined to ensure that our patients receive the same standards of high quality care at any point in time, whether night or day. ‘We know that every ward works differently and every shift can be different with skills spread unevenly across the 24 hours. The nurse-led Nightingale Project - named by the nursing staff in honour of Florence Nightingale who established her nursing school at St Thomas' Hospital in 1859 - seeks to minimise these inconsistencies and will see staff from different clinical backgrounds working more consistently as a team. ‘The way we are approaching this project is only possible because of the outstanding cadre of ward leaders we have,’ says Dame Eileen. 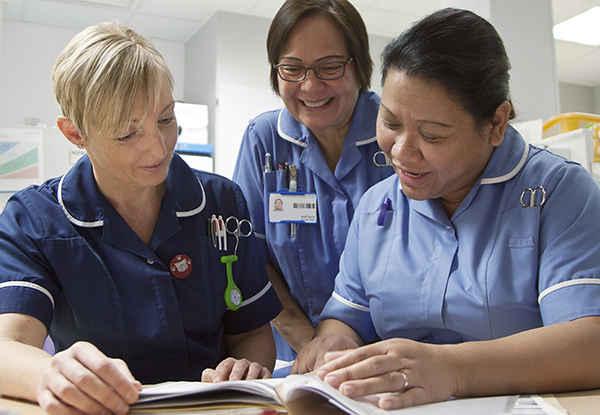 The participating nurses will determine what changes are needed to establish a consistent, standardised approach to the delivery of care across the trust. Anticipated outcomes include improvements in patient safety and higher rates of patient satisfaction with the care they receive. In addition, the trust anticipates this approach will also benefit staff, including boosting staff satisfaction and having a positive impact on their health and wellbeing. The project will initially involve testing and learning through simulation and 11 test and learn sites have been identified including hospital wards, community services and the Evelina London Children’s Hospital. The ward sisters and matrons are working in partnership with members of the trust’s senior multidisciplinary team on the project. Being involved from the beginning and leading on changes that will have a positive impact on both patient and staff experience is exciting says ward matron Claire Bluemel. Ms Bluemel works on Blundell ward – an ear, nose, throat and head and neck ward. ‘We’re bringing staff together from the shop floor to discuss their experiences and what they would like to see trialled. We’re learning from best practice with the aim of standardising this across all areas to benefit patients and staff. Launched on International Nurses Day (May 12), the project has started with a focus on the first and last hour of shifts and looking at how nursing staff are deployed. In groups the participants look at one of the three main work streams forming the first phase - shaping the beginning and end of the working day, how staff are rostered and how staff are allocated. They meet every Friday for three hours, with the first two hours involving group discussion on their individual project strands. Everyone comes together for the last hour to discuss what they have learned, to canvas opinion and to decide what they would like to test in simulation. The focus on the first and last hours of shifts has been introduced to improve a key factor for both patient and staff experience. Ideas that have been suggested to improve consistency at the beginning of shifts include a safety briefing to highlight what is important for the team that day that will identify patient risk factors. At the end of shifts, the suggested focus is on ensuring that staff are getting away on time and that the ward or clinical environment is ready to be handed over to the next team to facilitate this. ‘The ideas, the organisation and the flow of the project is really coming from the ward sisters and matrons,’ says head of nursing, revalidation and education Julie Hamilton. ‘I’ve never been in a room where there has been as much energy, commitment and enthusiasm as we’re seeing. Although we have only been meeting for a few weeks, we have already mapped out that first hour of the shift including welcoming each other, the handover and introducing a safety brief. There are also plans to transform the rota system. Although the project is still relatively new, the enthusiasm of the nurses has led to ideas being instantly tried on some of the wards that have been designated as test and learn sites. This has included the introduction of midday wellbeing check-ins – an idea that is being trialled by Lizzie Hunt, a sister on Blundell ward. ‘It has been really great to see what other wards are doing well and try some of those ideas here,’ says Ms Hunt. ‘We have recently started to get everyone together on the ward to do a quick well-being check in at lunchtimes. Asking if everyone’s okay, finding out if anyone is struggling with anything and identifying if there have been any changes to patients that morning. One of the project’s aims is to improve staff satisfaction and the participating nurses have provided questionnaires to their front line staff to gauge reactions. Once the framework for the first phase areas has been decided upon, these will be tested through simulation in each of the sites before being rolled out trust-wide towards the end of the year. Plans for the second phase of the project include looking at the standardisation of clinical roles. Ms Hunt says the high number of responses she has received from her team illustrates that staff are on board with the project. Don’t stifle staff with your plans. It’s not about standardising 100% of things because you can’t. You have to allow an element of intuition and experience. Look at standardising 60-70% of what you do and the rest will be responding to what’s happening in your clinical environment. Avoid having a top-down approach and ensure that you engage with the staff who are going to be delivering the care. Making sure you include staff is vital. Think about patient engagement - what do they think about the care that is been given? Patient surveys and focus groups can help to ensure patients are involved from the beginning as well.